The second day of the weekend-long Lost Shores event has started and unfortunately not all is well in the world of Tyria. 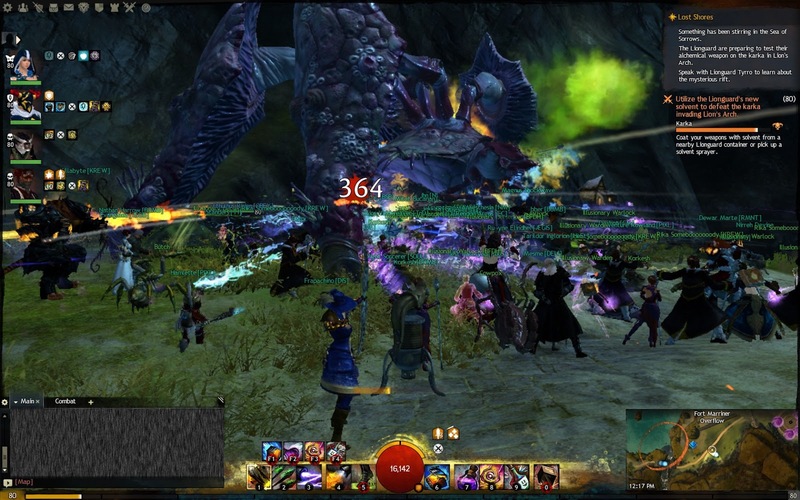 Day One quest chains were still bugged out, even after a supposed bug fix patch was released in the early hours of the morning, and adventurers were growing even more frustrated with their inability to experience the story ArenaNet had crafted for the weekend. Things did not bode well for the MMO developers chances to impress all those new players they had drawn into the game with the trial key giveaways. Players gathered around Levvi, waiting for the Phase Two event to kick off. 12:00pm server time came and went, leaving the adventurers puzzled. Where was the next major event, where were the karka that were supposed to attack Lions Arch once more? They were nowhere to be seen. All adventurers were left with was an updated meta-event text stating something about testing out new weapons on the Karka, but where these weapons were, and how you went about testing them, nobody knew. There was no cutscene to show us the way, no hints from ArenaNet like there had been yesterday. Today we were left believing something had gone dreadfully wrong. Fifteen minutes after the even start time, there was at last some progress. Apparently the Lionguard, under the direction of Magnus, were building a siege weapon to attack the Ancient Karka with. Now that things were at last underway, Magnus, along with Levvi and Kiel, lead us to the walls of Fort Marriner, where we could see the aforementioned trebulchet. That was the moment the karka chose to attack. Like the previous event, the Ancient Karka sent waves of lesser karka against us, but this time we were prepared. Barrels of a toxic substance harmful to the karka were scattered across the land between Fort Marriner and the lighthouse. This time the egg-layers fell with ease, the toxin ripping through their shells. Forced into a confrontation, the Ancient Karka joins the fight, but this is where the problems start. On some servers the boss vanished without a trace, leaving adventurers without any event rewards or completion bonuses. On other servers the karka's health continously reset, making him impossible to defeat. Unfortunately, my server was one of those affected by this bug, which means I missed what end to the event there could have been. Upon my return to Lions Arch, after exploring a couple other points of interest in the event weekend, I found the boss gone, having vanished into thin air. Regretfully, this was the outcome many got when taking part in the event. I'm afraid to say Day Two started on a worse note than Day One, at least the first event was achievable. All that is left for adventurers now is to continue the storyline on into the Southsun Cove, via the shipmaster at the Lions Arch docks. Stay tuned for more details and screenshots of Southsun Cove as Unfathomable Writings embarks upon their voyage across the Sea of Sorrows. To further note, it appears the event continued on into Southsun Cove, but since I was unfortunate enough to be caught on one of the overflows that was bugged out I have no screenshots or experience from the taking of the island. From youtube videos I watched, it appears the better part of the event was on the island. 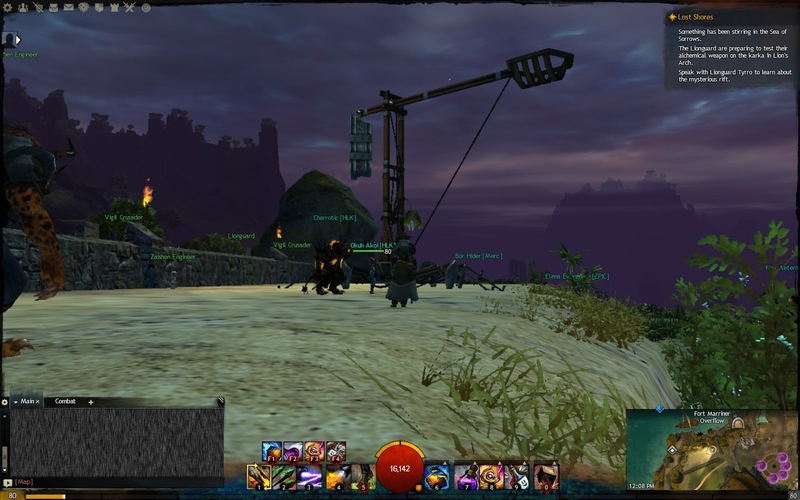 Why it was ever opened before the Ancient Karka was killed in Lions Arch I'll never know, but the outcome was that by the time we actually got to Southsun Cove, the event was well and truly over due to the influx of players who ditched the fight in LA to go do the island instead.